Buena Vista's Ruben Gonzalez Dies at 84 Pianist Ruben Gonzalez was a member of the Buena Vista Social Club, a group of musicians profiled in the documentary Buena Vista Social Club, which sparked international interest in traditional Cuban music. Ruben Gonzalez, one of the stars of the band Buena Vista Social Club, died Monday in Havana. He was 84. 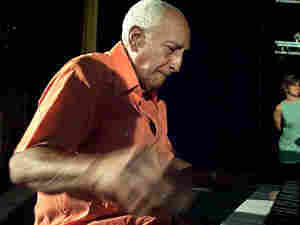 Gonzalez was the pianist of the group that helped spark a renaissance in traditional Cuban music. When the album Buena Vista Social Club was recorded in 1996, Gonzalez didn't even own a piano. His instrument had rotted from age, and he suffered from arthritis. Gonzalez, then 77, was so enthusiastic about playing the music, friends say he was always the first at the studio, waiting patiently every morning for the doors to be unlocked. Gonzalez was known for his suave virtuosity and playful charisma. Musician Ry Cooder, who produced the Buena Vista album, called him the best piano soloist he had ever seen — like a cross between Thelonious Monk and Felix the Cat. After more than a half-century in the business, Gonzalez went on to record two solo albums, Introducing Ruben Gonzalez and Chanchullo.